Apply Red-y to Rock to your underneath layers only, so you see a flash of red when hair moves—like the red soles on your favorite high-fashion heels! Afraid to commit? (To highlights, that is.) 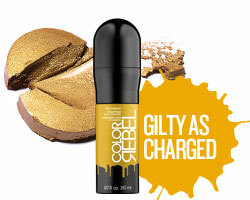 Apply Gilty as Charged where the sun would naturally hit your hair for shimmering temporary highlights. Matching lips and nails? Been there, done that. Try matching your hair makeup to your nails instead. 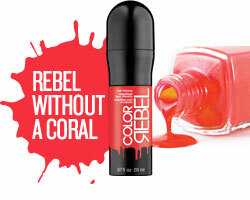 Our pick: Rebel Without a Coral + Essie Serial Shopper. Make your style stand out! Borrow a look from fashion and try color-blocking. 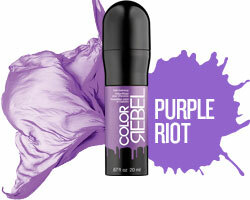 Apply Purple Riot in 1–2 inch panels for a cool color-blocked effect. Take your style for a dip! 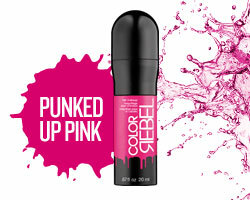 Dip-dye your ends with Punked Up Pink to add a touch of bright, splashy attitude. 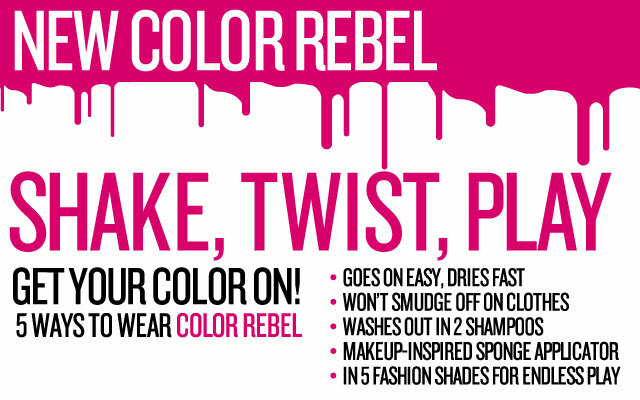 Color Rebel works best with clean or day-after hair. Avoid applying to hair with heavy product buildup and/or oils. Shake well and twist the cap in the direction of the arrows until the tip is saturated. Gently pull sections taut and apply in a smooth sweeping motion. Start with a light layer—you can always add more. 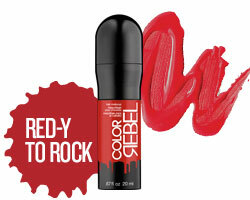 Color Rebel will dry quickly on its own, but for even faster results, you can blow dry the product into the hair.